I noticed that a new song of mine has the same chord progression as Jay-Z’s brilliant Moments-sampled new track. So I upped the BPM of the original from 86.65BPM to 105BPM and added some more samples; taking Dan Deacon’s Slow With Horns and speeding it up considerably and pitching it a few cents and also, for the second verse, I noticed Empire State is in F#m which is the same key as Michael Jackson’s Billie Jean so I took the otherwise minor sounding bassline from Billie Jean and put it under the feel-good majors of Empire State. I added bass, organs, vocoder, and my voice and had some friends help with the gang vocals for the chorus and I re-sampled the drums from Empire to make a new beat out of its sampled drums. I would have liked to speed it up more like to 120BPM but the vocals sounded silly sped up that much and there aren’t any official acapellas released so Jay-z’s vocals over my chord progressions are the best I could clean them up to be from the really lo-fi DIY one I found on the internet. Hope you enjoy it. Canadian Music Fest has announced its first round of confirmed bands for the 5 day festival/conference in March. One huge list of bands I’d never want to see and bands I can’t wait to see. 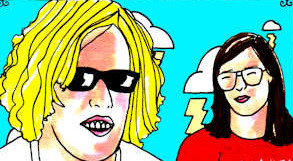 Free Energy are on Daytrotter. Hear some new music from The Album Leaf called Falling From The Sun off the upcoming release of Chorus Of Storytellers (Subpop). 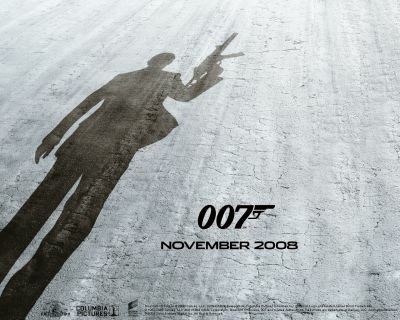 We finally have the theme for the upcoming Bond film The Quantum Of Solace. Another Way To Die, written by Jack White, performed by him and Alicia Keys. What do you think? Head here to take a listen. There’s a part in there with a battle between Alicia’s vocal scats and Jack’s fuzzed out guitar. Sounds like something Page and Plant used to do, could that have been from Jack hanging out with Jimmy?